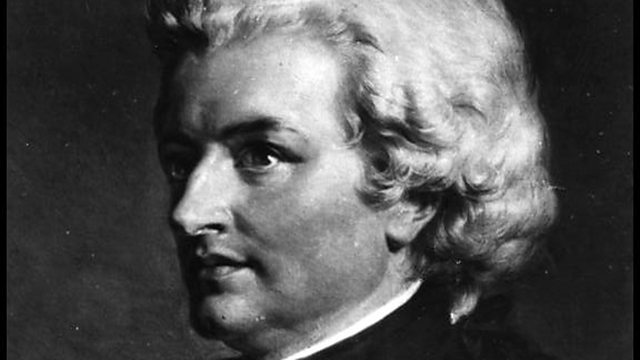 Donald Macleod explores the aftermath of the death of Mozart's father, Leopold, in 1787. Including an excerpt from the 1787 Prague version of Don Giovanni. Donald Macleod explores the aftermath of the death of Mozart's father, Leopold, in 1787. This week, Donald Macleod dips into five key years of Mozart's life, and presents five of his chamber works for solo wind and strings. These works span Mozart's entire career, ranging from his four exquisite flute quartets to the late clarinet quintet - arguably one of the greatest chamber works ever composed. 1787 saw Mozart visit Prague for the first time, where he was received with both a rapturous welcome and a new operatic commission - Don Giovanni. Yet amongst the year's tremendous success, he suffered the loss of the most influential figure in his life, his father Leopold. Donald Macleod introduces two perennial favourites, "Eine Kleine Nachtmusik" and the "Catalogue" Aria from Don Giovanni, as well as Mozart's exquisite Flute Quartet no.4. Choir: Chorus Viennensis. Conductor: Uwe Christian Harrer. Performer: Roy Goodman. Orchestra: The Hanover Band. Orchestra: Salzburg Chamber Soloists. Performer: Sharon Bezaly. Singer: Andreas Scholl. Performer: Tamar Halperin. Orchestra: Turin Teatro Regio Orchestra. Singer: Ildebrando d' Arcangelo. Conductor: Gianandrea Noseda.